An Airbus A380 plane stands on the tarmac before taking off at the Airshow China 2014 in Zhuhai, south China’s Guangdong province. PARIS: European aerospace giant Airbus said its profits had nearly halved in the third quarter, as it ran into headwinds from adverse foreign exchange moves. Airbus profits in the third quarter came in at 264 million euros ($329 million), a drop of 41 percent compared to the same period the previous year. Turnover was stable however at 13.3 bilion euros, the group said. “In the third quarter of 2014, net income was reduced by negative foreign exchange revaluation on US dollar liabilities,” the group said in a statement. Over the first nine months of the year, net profit was up 16 percent to 1.4 billion euros, prompting the group to maintain their forecasts for this year and next year. “An improved operational performance drove revenues and profitability higher over the nine months of 2014,” said Airbus CEO Tom Enders. The value of the all-important order book stood at 765 billion euros at the end of September, compared to 681 billion euros at the end of last year. 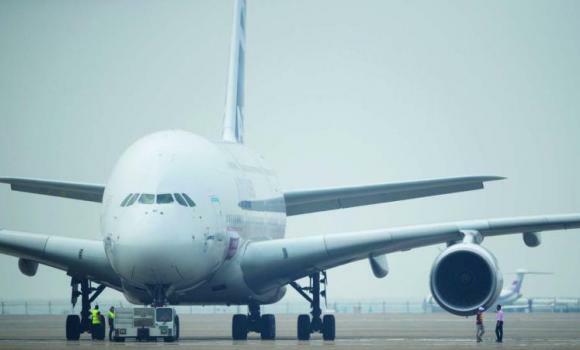 However, Airbus said it had received orders worth 79 billion euros in the past nine months, compared to 137 billion euros in the first nine months of last year.